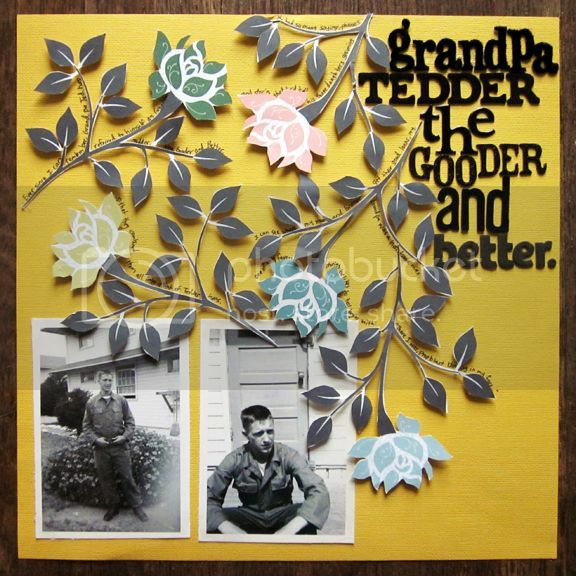 Grandpa Tedder the Gooder and Better. Tips and tricks: I actually didn't watch anything while scrapping today. I just wasn't in the mood I guess. In my drawer of "to scrap" photos I have a book full of pictures of my Grandpa Ted from back in the day when he was a soldier. (Grandma if you want this album back let me know and I can bring it in August). All of the pictures have deckled edges and are held in the book with photo corners. That's old school scrapbooking for ya! :) So I chose two of my favorite pictures of him, trimmed down the deckled edges, and glued them to a yellow cardstock background. Then I spent a good amount of time handcutting these flowers from patterned paper. I stuck the flowers around the photos using pop dots. Then I found six different kinds of black Thickers, the smaller the better, in my stash. Each word is a different texture - I used velvet, flocked, epoxy, glitter, vinyl, and fabric. American Crafts also makes foil, foam, regular chipboard, glossy chipboard, etc. So many options, that's why I heart them. Once everything was in place I journaled around the flowers. 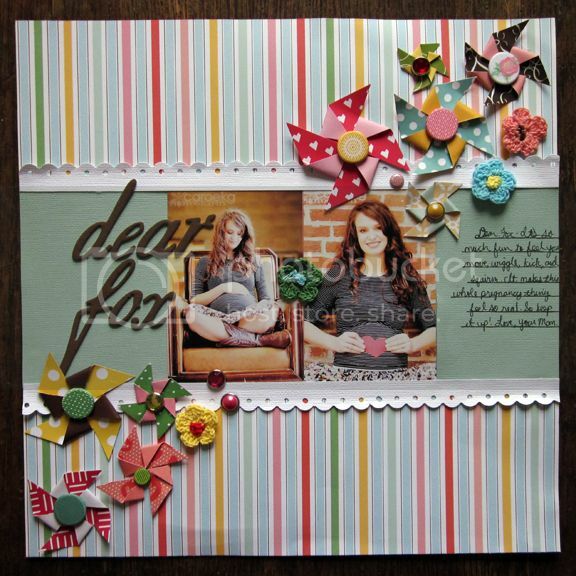 Tips and tricks: I wanted the main embellishment of this layout to be pinwheels so I chose a patterned paper background that matched my photos and picked one color patterned papers to make the pinwheels out of. I cut various sized squares from the papers, snipped from the corners towards the middle, pulled every other section to the middle, and secured them all to the middle with a brad. I added some crocheted flowers and fancy brads to the mix. I like to lay everything in place before I glue it down and take a picture of it in case Rachel comes in and starts batting all my little pieces around. Journaling says: Dear Fox - It's so much fun to feel you move, wiggle, kick, and squirm. It makes this whole pregnancy thing feel so real. So keep it up! Love, your Mom. I love these two pages, so gorgeous! These layouts are both soooooo good! I love these pages! Beautiful work! ove these! love all the cut out work on the 1st one & the second one is so darn cute! awww this is such a cute scrap layout!oh, and by the way do you already have a name planned out for the baby?? Both awesome, awesome layouts Paige!!!! Love both your layouts...the one about your grandpa really speaks to me...must get some photos of my grandfathers scrapped soon!! You look adorable--and I love the name Fox. My friends have a Fox and he is the cutest thing ever!